Semi-Rugged Dell Latitude E6430. Core i5 3rd Gen. We will respond to you within 24 hours. It must be complete with all accessories and in the original condition it was sent. DMI System Product Latitude E6430ATG. Tested for 100% Functionality both hardware and Software. Battery is used and Functional. Logon Domain Dell-PC. Internet Explorer 11.0.9600.18697. Mouse Dell Touchpad. 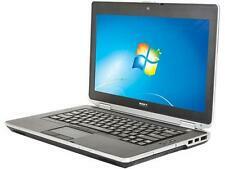 • (1) - DELL LATITUDE E6430 14" 1366X768 LAPTOP 4XF49A00. • (1) - 128GB SSD SOLID STATE DRIVE STORAGE. Semi-Rugged Dell Latitude E6430. Core i5 3rd Gen. bezel has crack on the top left hand side. no effect on the laptop. We will respond to you within 24 hours. It must be complete with all accessories and in the original condition it was sent. Laptop is in excellent condition and fully bench tested. Type: Notebook/LaptopBrand: DellProcessor: Intel Core i5 3rd Gen.
For Sale is Dell Latitude E6430 Core i5 3rd Gen. Pre installed with Windows 7 Pro 64bit. US QWERTY keyboard. 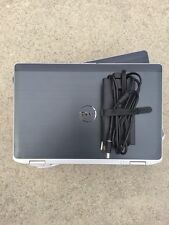 Dell Latitude E6430 14.1" Laptop. 320GB HDD STORAGE. Windows 7 Professional fully Installed. Brand: DellProcessor: Intel Core i5 3rd Gen. 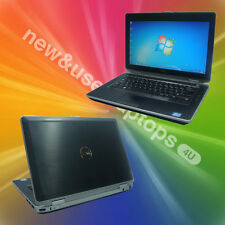 Type: Notebook/LaptopBrand: DellProcessor: Intel Core i3 3rd Gen.
Dell Latitude E6430 laptop in good condition. 250 or 320GB SATA. Built in 1000 Gigabit Network Port, Wireless (WiFi), BlueTooth. None (fresh Windows installed). Excellent condition as seen in pictures, few minor marks on the lid as expected from an ex-corporate laptop. Latitude E6430. HDD (Hard Disk Drive). Hard Drive Type Hard Drive Capacity This item is Grade. A Grade – Excellent condition. Case Condition – Scratched, Case Condition – Dented, Keyboard – Shiny Keys. Make / Model Dell Latitude E6430. Hard Drive 320GB. Mouse / Point Device Dual point system Multi-touchpad. Laptop Specification. Optical Drive DVD Drive. Other Various Ports HDMI. Keyboard US QWERTY Keyboard. Dell Latitude E6430. 4GB Ram @ 2.7GHZ. Dell Latitude E6430 laptop in good condition. 128GB SSD (SATA). Built in 1000 Gigabit Network Port, Wireless (WiFi), BlueTooth. None (fresh Windows installed). Excellent condition as seen in pictures, few minor marks on the lid as expected from an ex-corporate laptop. Dell Latitude E6430 - Intel Core i5-3320M - 8GB RAM 320GB HDD HDMI Laptop 14.1"
Dell Latitude E6430 Laptop - Intel Core i5-3320M - 16GB RAM 320GB HDD HDMI 14.1"
Dell Latitude E6430 - Intel Core i5-3320M - 4GB RAM 320GB HDD HDMI Laptop 14.1"
Dell Latitude E6430 - Intel Core i7-3520M - 8GB RAM 320GB HDD HDMI Laptop 14.1"
Latitude E6430. HDD (Hard Disk Drive). Hard Drive Type Hard Drive Capacity This item is Grade. A Grade – Excellent condition. Case Condition – Scratched, Case Condition – Dented. A2 Grade – Excellent condition – one or two minor imperfections. Processor: Intel Core i7 3rd Gen.